Ash is fairly well known for his catch phrase "Gotta catch em all". But recalling the series, it feels as if he did not even manage to catch a quarter of them. So how many did he manage to catch? Lets count? I am including pokemon such as Charmander, Chimchar etc, which joined ash of their own will without battle as CAUGHT. List of Ash's Pokemon. Pikachu - Given. Not caught. Caterpie - Caught. Released as a Butterfree. Charmander - Caught. Joined Ash of his own will. Left to train. Rejoined and with Oak now. Squirtle - Caught. Released back to the Squirtle Squad. Haunter - Joined Ash for fun. Left for Sabrina. Primeape - Caught. Left for Fighting trainer. Muk - Caught in power plant. Tauros - Caught in Safari Zone. Lapras - Caught. Released with family. Snorlax - Caught on Orange Island. Beedrill - Caught in Bug Catching contest. Released to Casey. Tepig - Another fire starter left by trainer. Caught. With Oak as a Pignite. Rowlet - Caught! Ash has caught his first pokemon in Alola. Litten - Caught! With Ash. Poipole - Caught! With Ash. Tl;Dr Ash has got 52 unique pokemon species. He got 2 (pikachu, Oshawott), Traded for 2 (Raticate, Buizel), hatched 4 (Larvitar, Phanpy, Scraggy and Noibat). Also Haunter just travelled with him so not counted as catching. Thus Ash has CAUGHT [52-(2+2+4+1) = ]43 unique species. Edit: As requested by OP removed a quote referencing the number of pokemon dexed by Ash. 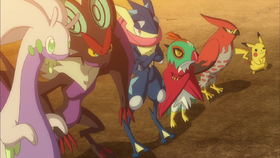 Dexed pokemon are a larger set of pokemon, which include hatched, evolved and owned in any other way (Gift/Trade etc.). 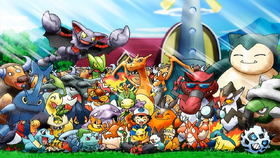 According to Bulbapedia, Ash has owned a total of 80 different species of Pokemon, although he currently owns 68 (including 30 Tauros) thanks to evolution, trading, and other changes of ownership. You forgot about Snivy in the count for the Unova region. This article on Bulbapedia gives a brief description of the circumstances around it's capture.